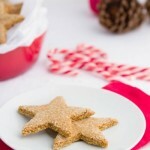 Zimtsterne (cinnamon stars) are one of the most popular of German Christmas cookies. Enjoyed by my in-laws, these cookies are naturally gluten-free, grain-free, but loaded with sugar… and they’re not so easy to make, either. With a love for these cookies, I’ve devised a way to make them much healthier and still maintaining their authentic taste and consistency. Preheat your oven to 200F and line a baking sheet with parchment paper or a silicon baking mat. Combine half of the ground coconut sugar with ground almonds and cinnamon in a medium-sized bowl. Whisk to combine and set aside. Whip the egg whites with a whisk or hand blender until foamy. Add remaining ground coconut sugar and fresh lemon zest. Whisk to combine. Add the almond flour to the egg white mixture and combine with a spoon or hand mixer. It is normal for the dough to be sticky. Separate the dough into 3 sections, removing one section and placing on a sheet of parchment paper. Roll out to 1/4-inch thick, dusting the top of the dough with additional ground almonds if needed. 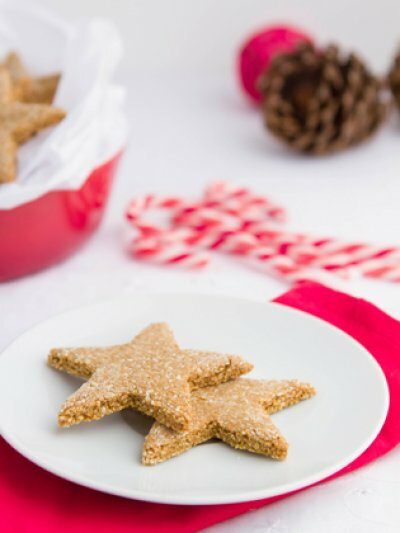 Use a 2-inch star cookie cutter to press star shapes into the dough. Using a thin spatula, lift each cookie from the parchment paper and place on prepared cookie sheet. There’s no need to leave much space in between the cookies as they do not expand too much. 1/4-inch will do the trick. Place baking sheet in preheated oven for 30-35 minutes until the cookies are lightly golden and firm throughout. Turn off the oven, open the oven door just a crack and leave the cookies to dry out for an additional 10 minutes. Remove from the oven and transfer cookies to a cooling rack to cool for 30 minutes.